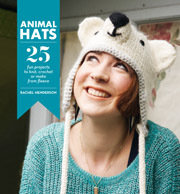 Make this fun hat with our free pattern from Rachel Henderson’s new book, Animal Hats. This superb book features 25 fun hats to knit, crochet or make from fleece. If you like knitting in the round, this sweet polar bear hat is the perfect project for you, and it’s ideal for when conditions are arctic. ~ Oddment of black yarn. ~ Stuffing or toy filling. ~ 4.5mm (US 7) crochet hook. Using 2 x 5mm (US 8) dpns and yarn A, cast on 5 sts. Row 1: k1, kfb, k1, kfb, k1 (7 sts). Row 2: and every alt row: p to end. Row 3: k1, kfb, k3, kfb, k1 (9 sts). Row 5: k1, kfb, k5, kfb, k1 (11 sts). Row 7: k1, kfb, k7, kfb, k1 (13 sts). Row 9: k1, kfb, k9, kfb, k1 (15 sts). Row 11: k1, kfb, k11, kfb, k1 (17 sts). Row 13: k1, kfb, k13, kfb, k1 (19 sts). Continue straight in st st until earflap measures 9cm/31/2in. Leave sts on spare needle. Using 5mm (US 8) circular needle and yarn A, cast on 8 sts. k across 19 sts of second earflap, then cast on 8 sts (77 sts). Round 1: *k5, k2tog, rep from * to end (66 sts). Round 2: and every alt round: k to end. Round 3: *k4, k2tog, rep from * to end (55 sts). Round 5: *k3, k2tog, rep from * to end (44 sts). Round 7: *k2, k2tog, rep from * to end (33 sts). Round 9: *k1, k2tog, rep from * to end (22 sts). Round 10: *k2tog, rep from * to end (11 sts). Round 11: k2tog to last st, k1. each of 3 needles). Join into a circle and place round marker. Round 5: *k2tog, repeat from * to end of round (12 sts). Round 6–7: k to end. Round 8: *k3tog, repeat from * to end of round (4 sts). each of 3 needles). Join into circle and place round marker. Round 7: *k2tog, repeat from * to end (15 sts). Rounds 8–10: k to end. Round 11: *k2tog, repeat from * to last st, k1 (8 sts). Round 12: k to end. Round 13: *k2tog, repeat from * to end (4 sts). Weave in all ends. Using 4.5mm (US 7) crochet hook and yarn B, work 2 rows of double crochet (see page 30) around the edge of the hat and earflaps. Position the ears on the sides of the hat 5cm/2in from the centre-top, using the picture opposite to guide you, and attach them to the hat using an overstitch. Stuff the muzzle with toy filling. Position it on the front of the hat using the picture opposite to guide you, and attach it using an overstitch. Embroider the nose and mouth using satin stitch and backstitch. Embroider the eyes using satin stitch. yarn A. Attach a cord to each earflap. 8cm/31/4in diameter. Attach 1 pom pom to the end of each cord. Cast on the required number of stitches onto 1 of your dpns and knit all stitches. Now slide all of your stitches worked to the other end of the dpn in your right hand and transfer that needle to your left hand. With the working yarn at the back of the work, insert your right needle into the first stitch on the left needle. Pull the working yarn tightly up to the tip of the right needle and knit that stitch. Continue to knit the rest of the stitches along the row. Repeat in this way until you have the required length of fabric. 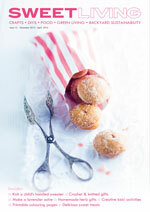 Extracted with permission from Animal Hats by Rachel Henderson, published by Kyle Books and distributed in New Zealand by New Holland, RRP $34.99. Rachel Henderson’s new book, Animal Hats, is packed full of fun projects that show you how to create hand-stitched hats using both fleecy fabrics and woolly yarns. It doesn’t matter if you’re a total beginner or an experienced stitcher, there are designs suitable for all and there are no limits to where your creativity can go… a fox, a dragon, a lamb, a polar or a panda bear…find your inner animal and make a hat to make them smile. I’m just wondering why it is for adults? I don’t know any grown woman who would wear a hat like this, but many many little kids who would love to have a polar bear hat…. There is apparently a big trend at the moment for teenagers and young adults to wear animal hats, as started by celebrities such as Paris Hilton, Katy Perry and Snoop Dogg. I would imagine making it up on size 6 needles and adjusting the length would make it work for smaller people. This is a darling pattern ~ thanks for sharing . I would wear this hat in a heartbeat! Life is just too short not to have fun and a good laugh. Last year I made my husband a fox-head hat and I now have a long list of friends begging me to make one for them and a store owner who has requested that I make some for her shop–all for adults! Thanks Peggy. I agree! Adults should indulge. Would love to see your fox hat! Jane. Hi! I want to make this hat for an infant, but I am a beginner and am uncertain how to properly reduce the size. Any tips? I have many hats like this…..and I’m 62! I’m old, not dead. That’s fabulous. And you’re not old at all!! Where’s the pattern information for the nose/muzzle?? Hi Laura, the muzzle bit is actually the ‘knitted mouth’ section. I agree, would love to make for my grand kids. This is an awesome looking hat. Love it! I noticed that there are certain rounds missing. Is this just a typo with the numbers, or should there be something in between? Hi Autumn. No the rows are there, but it may be a little confusing. If you look at Row 2, for example, it says “Row 2 and every alt row p to end” So Rows 4, 6, 8, etc are “p to end”. kfb = knit into the front and back of the loop to create 2 stitches from 1. My daughter will absolutely love this. She is an adult with a room full of polar bears! I know she will wear this! I can hardly wait to get started! Great! It’s such a fun pattern, isn’t it? Thanks Sarah. We’re stoked everyone is enjoying the pattern. Thanks for this great pattern!! I now have orders for 1 grandaughter & 2 daughters for Christmas . I’m making one for me after the holidays. Thank You so much. I have made this pattern using my handspun gray Jacob wool. Jacob spun Jacob. Turned out great ! Although I made tassels for the icord ends because I detest pompons on hats with the fire of a thousand burning suns. I was wondering if there was a pattern for a babies size hat? I’m sorry, it’s only in adult size. This is Lindsay again. When putting the ear flaps and casting on the circular needles do I need to do a two needle cast on? Because, there is no tail to do the thumb cast on method. Hi Lindsay. So sorry, this is a book extract so not a pattern we’ve devised ourselves. Maybe another reader who has knitted this can help. This stumped me too so I googled it. There are several great you-tube tutorials showing how to do this. Would make a good koala hat with a few adaptation in colour. Hi! Does anyone have this Polar Bear Hat in an infant/new borne size? Thank you so much!! I’m from the US, so maybe it’s for that reason I’m having trouble with the measurements on this pattern. When it says knit until ear flap is 9cm/31/2in, then again knit until hat is 14cm/51/2in. #1 – what do the 31 and the 51 in the middle mean? #2 – 9cm = 3.6 in (not 2 as printed) and 14cm = 5.5 in (not 2 as printed). This has me confused. Am I missing something? Misty – 14cm/51/2in. = 5.5 or 5 1/2″ & 9cm/31/2in = 3.5 or 3 1/2″. Hope this helps. Spacing can be a problem sometimes. I love this hat and I am ready to make this hat for my grandson but how to make it work for a little guy. There are a lot of pieces so I don’t know what to do about sizing. Can you point me where there might be a pattern just for kids?